I really can't put an accurate statistic on this, but I would have to say close to 1 in 4 lawns are streaky in color from poorly spreading the fertilizer. I couldn't help but notice this last summer in my travels around my city. I spent a lot of time meeting people, and taking pictures of their beautiful yards. I decided to put together a few tips that some of you may or may not know. At the bottom of this page I will give you a great "trick of the trade" to make things much easier for everyone. Before we get into the other tips on how to fertilize lawn effectively, some of you may have just dropped in on this page from the internet. We have a complete module on fertilizing in our lawn care and maintenance section if you require further assistance. This will help you understand the basics of why, when and how to fertilize. The most important thing to remember about fertilizer is that it should never be viewed as a "cure all" or "fix" for a lawn problem. If you are finding your fertilizer is not very effective at giving you growth and color changes, you may actually have soil problems. See our section on lawn repair. The worst and most obvious streaky lawns were the result of using a drop spreader. It seems that most people have a hard time making each pass join with the previous one. If you forget where you stopped, your lawn will surely let you, and everyone else on the street know. You have to pay attention to the wheel tracks from your spreader. To do this, you may have to let your lawn grow just a little longer before you fertilize. This way the grass will be “mat” down easier from the weight of the spreader on the wheels. If this doesn't work, tie a 5 lb. weight or something heavy to the spreader. Depending on the width of the spreader opening, you may have to just slightly overlap the tire track with each pass. Broadcast spreaders are my first choice, but may not be yours. They cover a larger area which makes the work easier. Don't start on the perimeter of a lawn because they can throw the pellets quite far. Move the spreader into the lawn area so you don't end up fertilizing the driveway, street, or anything else that doesn't need it. Pay attention to the width of lawn you cover with each pass, and pace yourself to a consistent walking speed so this doesn't change. Hose attachment fertilizers are becoming quite popular. There are a lot of them out there, and they aren't all the same. Read the directions thoroughly before you start. If you are new at using a hose attachment type fertilizer for the first time, do an inconspicuous area first. Pick a spot that nobody will see. Get the hang of how to do it before you tackle your front yard. The easiest way to fertilize evenly is to follow this little tip. The companies have recommended applications for applying fertilizer on the bags. Read the instructions carefully. They will tell you what setting to use based on the spreader you are using. They do this with a dial. The dial controls the amount of fertilizer being dropped by opening and closing the gate at the bottom. Cut the recommended setting in half. Think of your lawn as a grid. (See picture above.) 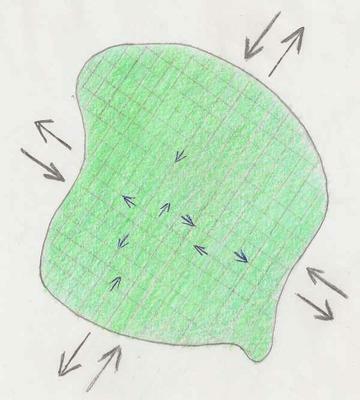 Start by covering the grid by making passes back and forth across the lawn. Next, make the same back and forth passes at 90 degree angles to the previous passes. Using half the recommended application on each pass, and crossing your lawn twice at different angles will give you a more even application. This will help you avoid having a streaky lawn. So that's my little trick of the trade. I hope it helps those that had this problem in the past. Hey, thanks a lot for the help. I had been thinking about fertilizing the lawn as I find that they are lacking it very much and the health of the grasses are getting too bad. I hope this method can be very effective and would not be any need to fertilize anytime soon.